All hail the frontwoman. Lead singer, tastemaker, spokeswoman – she’s your girl. She is effortlessly cool, always exuding confidence and strength. She is sensuous without your unnecessary sexualization; she is glamour, she is punk, she is whatever the hell she wants to be. From Debbie Harry to Beyoncé, history’s most influential frontwomen have paved a way for all ladies to pursue their passions with grace (when necessary), power, and fierce resolution. We salute these women for all they have done in the music industry and beyond, and have created this new series to celebrate just a few of our favorites. Before she was the mononymous Björk, she was Björk Guðmundsdóttir, frontwoman of acclaimed Icelandic rock band the Sugarcubes. The band, which would later disband in 1992, formed on June 8, 1986 with Björk on vocals and her then-husband Þór (Thor) Eldon on guitar. It was on this same day that Björk gave birth to her first child, Sindri – because why not? However, while the Sugarcubes would go on to help break Björk into the “mainstream”, they were far from her first musical endeavor. At age 11, she released her eponymous debut album after garnering child-stardom on Icelandic radio. In the teen years that followed, Björk helped to form multiple bands in the Icelandic music scene, from all-girl punk group “Spit and Snot” to jazz-punk duo “Tappi Tíkarrass” to witchy goth-rock band “Kukl”. While several of these bands reached relative underground notoriety in the UK, it was the Sugarcubes that would prove to be Björk’s breakout project on an international scale. The Sugarcubes were formed from a hodgepodge of oddball Icelandic musicians, including Kukl’s Einar Benediktsson, Einar Mellax, and Siggi Baldursson. Alongside Björk, Benediktsson would provide vocals for the band, adding a textural aural experience to the project through his vocal foil. While promoting Volta, Björk explained to SPIN that “when the Sugarcubes were formed, it was a joke. We got drunk and decided to start a pop band.” In order to fund the release of their first recordings, the band’s self-founded label, Bad Taste, sold printed postcards bearing the image of Mikhail Gorbachev and Ronald Reagan at the Reykjavík Summit. The campaign was successful enough that on November 21st, 1986 – Björk’s 21st birthday – the single was released. For a band that started out as “a joke”, the Sugarcubes’ initial critical reception was overwhelmingly positive and authentic. After experiencing considerable success in Iceland with their double A-side single of “Ammæli” (“Birthday”) and “Köttur” (“Cat”), the Sugarcubes released an English version of “Birthday” in 1987. A week later, seminal UK music weekly Melody Maker declared “Birthday” their single of the week, beginning a chain reaction that would culminate in the band signing a distribution deal with Elektra Records in the United States. Hailed by indie press as “the best band since the Smiths”, the Sugarcubes were offered massive sums of money to lease their creative control to the major labels. The band refused, and their debut full-length LP, Life’s Too Good, would go on to sell over one million copies worldwide. By the end of 1988, the Sugarcubes had performed for the likes of David Bowie and Iggy Pop, and appeared on Saturday Night Live. Björk’s performances with the Sugarcubes were accompanied by a sweetness that, at times, appeared either excessively playful or nearly impassive. Make no mistake – every creative decision by Björk is artfully purposeful, and these theatrics merely magnified her remarkable voice by proxy. 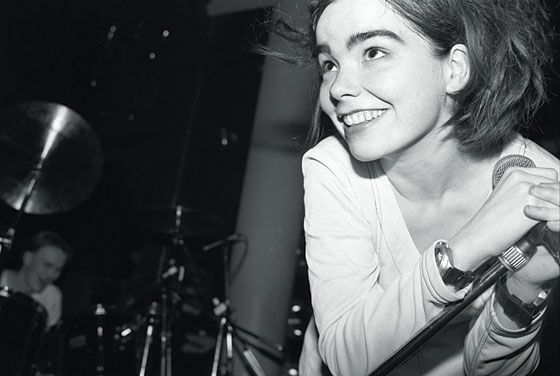 Björk’s signature vocals set the Sugarcubes apart from their contemporaries, and helped to cement the band’s place in history as the pinnacle of Icelandic rock. Her voice is a dextrous character of its own, pushing both high and low octaves with unusual power. On tracks like “Deus”, it is a controlled and airy soprano; on other tracks, like the appropriately-titled “Hetero Scum”, it trembles with an organic oppressiveness that domineers the song. Within the course of one line, Björk can distort her voice from something sickeningly sweet into something violently raw, morphing vocal runs into snarls and vise versa. Björk has always aimed for a “voice as flexible as the spine”. With the Sugarcubes, her voice was the star of the show. Her relatively reserved (that is, compared to her later performances as Björk) Sugarcubes stage presence granted her pipes full control of the audience. It is with the Sugarcubes that Björk would learn to further refine her vocal skills before delving into the intense vocal acrobatics characteristic of her solo releases. Practice makes perfect. By their third album, Björk was a bonafide celebrity in the American indie scene. She was partying in Manhattan with the club kids and walking in fashion shows for Betsey Johnson. Critics adored her; journalists flocked to her. In pre-show coverage from 1992, a journalist from the Washington Post described the frontwoman as “arrestingly cute”, with an “enchantingly high, spiraling voice (…) but fierce at the same time, sort of like that sweet-scary Chucky doll in the movies.” With the Sugarcubes, “cute” became synonymous with “Björk” in the press (“if one more person calls me ‘elfin’…” she lamented in that same journalist’s article). Perhaps it was this excessive infantilization of Björk in the press that would contribute to the singer’s ultimate decision to leave the band in 1992 in favor of a solo career. Of course, this is all speculation. Regardless, in later years, Björk’s performance style would develop a more mature quality that cleanly distinguished it from the juvenilia of the Sugarcubes. As frontwoman of the Sugarcubes, Björk spellbound audiences. But after a while, the members of the band were each interested in amiably moving onto other projects full-time. The band’s final tour, supporting U2, had them playing for over 700,000 people across the United States. The skills Björk developed with this group would be further refined over the course of the nineties to ultimately solidify her as one of the greatest artists of all time. Her resolve is audible with each line of the Sugarcubes’ short-but-sweet discography (the band only put out three full-length albums, the final one released after Björk had decided to leave the band but before her contractual obligations ended). Whether alongside the Sugarcubes in 1992 or in front of an orchestra in 2017, Björk will always continue to defy time, space, and the sound barrier with her performances as a band frontwoman. Keep up with everything Björk on Facebook, Twitter, and Instagram. Follow Modern Girls on Instagram and Twitter to stay up-to-date with the latest FRONTWOMAN SPOTLIGHT. Do you know of a lady that you want to see featured next? Drop us a line at moderngirlsinfo@gmail.com.